Arthur K. Wheelock Jr., “Frans Hals/Portrait of a Young Man/1646/1648,” Dutch Paintings of the Seventeenth Century, NGA Online Editions, https://purl.org/nga/collection/artobject/78 (accessed April 22, 2019). Frans Hals was the preeminent portrait painter in Haarlem, the most important artistic center of Holland in the early part of the seventeenth century. He was famous for his uncanny ability to portray his subjects with relatively few bold brushstrokes, and often used informal poses to enliven his portraits. Glancing straight at the viewer, this portly gentleman rests his elbow on the back of his chair. Hals’ earliest known use of this pose dates to 1626, and he continued to use it throughout his career. (See, for example, the National Gallery of Art’s portrait of Willem Coymans, 1645.) As is characteristic of Hals, the sitter’s face is more firmly modeled and detailed than are his costume and accessories, which are rendered in broader, more abstract brushstrokes. Hals has made the man’s face come to life by adding rapidly applied accents over the broad flesh tones. A few wavy strokes depict the lion’s-head finial of the chair, and an emphatic crisscross pattern describes the man’s flat lace collar. Just above the sitter’s hand, Hals signed the work with his initials—not just once, but twice: FHFH. Multiple interpretations have been proposed for this unique double monogram, including the possibility that Hals here portrayed his son Frans Hals the Younger (1618–1669). Although Hals’ son would have been the appropriate age for this portrait, no other supporting evidence for this identification exists, so the identity of the sitter and the reason for the double monogram remain mysteries. Petr Petrovich Semenoff, Études sur l’histoire de la peinture néerlandaise, 2 vols. (Saint Petersburg, 1885), 1:254, and Andrei Ivanovich Somof, Ermitage Impérial: Catalogue de la galerie des tableaux, 3rd ed., 2 vols. (Saint Petersburg, 1901), 2:139–140, no. 770. 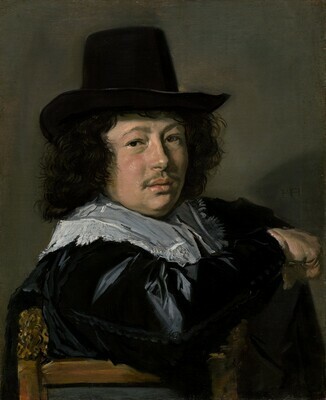 In this bust-length portrait, a portly young man rests his elbow on the back of his chair while he turns and looks directly at the viewer. His round, somewhat pudgy face is framed by shoulder-length curly hair and a black hat that rests squarely on his head. His black jacket is enlivened by a flat white collar with intricate lace edging. Seymour Slive, Frans Hals, 3 vols. (London, 1970–1974), 3:86, no. 167. Minor variations in technique between these portraits, however, suggest that Portrait of a Young Man must date slightly later than the portrait of Willem Coymans. Hals has animated this sitter’s face with rapidly applied light accents over the broad flesh tones that define the nose, cheeks, lower lip, and forehead. These strokes, just as those that articulate the eyebrows and mustache, are less integrated into the structure of the face than those in the Coymans portrait. Similarly, whereas in the Coymans portrait Hals conveys a sense of the translucent material from which the collar and sleeve are made, and of the elegantly brocaded pattern on the jacket, in the abstract rendering of the costume in Portrait of a Young Man neither the material character of the lace collar nor the lace pattern are suggested to such a degree. Finally, the lion’s-head finial of the chair is depicted with a few wavy strokes that give little information about its structure. The precise period of execution for this work is difficult to determine because Hals dated so few paintings after 1645. A probable date, however, is 1646/1648. Both the style of the collar and shape of the hat were in fashion in these years, as was shoulder-length hair. Hals’ portrait Adriaen van Ostade, which can be dated about 1646/1648, shows comparable characteristics in the style of costume as well as the abstract way in which it is rendered. That portrait also exhibits the use of highlights to enliven the otherwise firmly structured face and its features. Petr Petrovich Semenoff, Études sur l’histoire de la peinture néerlandaise, 2 vols. (Saint Petersburg, 1885), 1:254, and Andrei Ivanovich Somov, Ermitage Impérial: Catalogue de la galerie des tableaux, 3rd. ed., 2 vols. (Saint Petersburg, 1901), 2:139–140, no. 770. Although Hals’ son would have been the appropriate age for this portrait, no other supporting evidence for this identification exists, so the identity of the sitter and the reason for the double monogram remain mysteries. Sir Robert Walpole, 1st earl of Orford [1676-1745], Houghton Hall, Norfolk, by 1736; by inheritance to his son, Robert Walpole, 2nd earl of Orford [1700-1751], Houghton Hall; by inheritance to his son, George Walpole, 3rd earl of Orford [1730-1791], Houghton Hall; sold 1779 through Count Aleksei Semonovich Musin-Pushkin, Russian ambassador to England, to Catherine II, empress of Russia [1729-1796], Saint Petersburg; Imperial Hermitage Gallery, Saint Petersburg; sold February 1931 through (Matthiesen Gallery, Berlin; P. & D. Colnaghi & Co., London; and M. Knoedler & Co., New York) to Andrew W. Mellon, Pittsburgh and Washington, D.C.; deeded 1 May 1937 to The A.W. Mellon Educational and Charitable Trust, Pittsburgh; gift 1937 to NGA. Horace Walpole, "A Catalogue of the Right Honble. Sir Robert Walpole’s Collection of Pictures," 1736, autograph manuscript unsigned, pp. 33-34, PML 7586, The Morgan Library and Museum, New York. Houghton Hall: The Prime Minister, The Empress and The Heritage, Castle Museum Norwich; Kenwood House, London, 1996-1997, no. 12, repro., as Portrait of a Seated Man. Houghton Revisited: The Walpole Masterpieces from Catherine the Great's Hermitage, Houghton Hall, King's Lynn, 2013, no. 12, repro. Houghton Hall: Portrait of an English Country House, Museum of Fine Arts, Houston; California Palace of the Legion of Honor, The Fine Arts Museums of San Francisco; Frist Center for the Visual Arts, Nashville, 2014-2015, unnumbered catalogue, repro. The original support is a plain-woven fabric composed of heavy threads irregularly spun with numerous slubs, loose ends, and weave faults. It has been lined with most of the original tacking margins retained. Pressure upon lining has caused an emphasis of the coarse canvas texture and flattening of impasto. The support was laced onto a temporary strainer for priming. Remnants of the thick laces remain along the left and right edges. Cusping patterns also suggest that the primed fabric was re-laced to the strainer for painting before attachment to a stretcher. The support is sound, aside from a small hole to the right of the head. A warm tan granular ground layer is visible between broad brushstrokes of paint, which was applied in thin layers worked rapidly wet-into-wet and modeled with sharp, unblended brushstrokes. The background was applied first, with a reserve left for the face, which was painted next, followed by the clothing. The hair was worked over the face to define its precise contours. Scattered small losses are found overall, particularly along the edges. 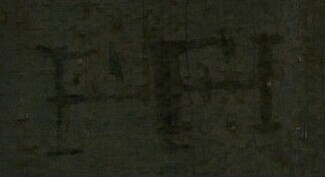 The bottom edge is ragged and damaged. Abrasion is slight. The painting underwent conservation treatment in 2007 to remove discolored varnish and inpainting. Walpole, Horace.A Catalogue of the Right Honorable Sir Robert Walpole’s Collection of Pictures. Unsigned autograph manuscript. Pierpont Morgan Library. The Morgan Library and Museum, PML 7586. New York, 1736: 33-34. Walpole, Horace. Aedes Walpolianae or A Description of the Collection of Pictures at Houghton Hall in Norfolk. London, 1747: 40. Gilpin, William. Observations on Several Parts of the Counties of Cambridge, Norfolk, Suffolk, and Essex. London, 1809: 69. Imperial Hermitage Museum. Livret de la Galérie Impériale de l’Ermitage de Saint Petersbourg. Saint Petersburg, 1838: 254, no. 26, as Self-Portrait. Köhne, Baron Bernhard de. Ermitage Impérial, Catalogue de la Galérie des Tableaux. Saint Petersburg, 1863: 165, no. 770, as Portrait of Frans Hals. Waagen, Gustav Friedrich. Die Gemäldesammlung in her kaiserlichen Ermitage zu St. Petersburg nebst Bemerkungen über andere dortige Kunstsammlungen. Munich, 1864: 172, no. 770. Köhne, Baron Bernhard de. Ermitage Impérial: Catalogue de la Galérie des Tableaux. 3 vols. 2nd ed. Saint Petersburg, 1870: 2:123, no. 770. Bode, Wilhelm von. Studien zur Geschichte der holländischen Malerei. Braunschweig, 1883: 90, 101, no. 128. Semenoff, Petr Petrovich. Études sur l’histoire de la peinture néerlandaise. 2 vols. Saint Petersburg, 1885: 1:254, as Portrait of Frans Hals the Younger. Somov, Andrei Ivanovich. Ermitage Impérial: Catalogue de la Galérie des Tableaux. 2 vols. 3rd ed. Saint Petersburg, 1895: 2:122-123, no. 770, repro. Knackfuss, Hermann. Frans Hals. Bielefeld and Leipzig, 1896: 52, repro. Somov, Andrei Ivanovich. Ermitage Impérial: Catalogue de la Galérie des Tableaux. 2 vols. 4th ed. Saint Petersburg, 1901: 2:139-140, no. 770, repro. Davies, Gerald S. Frans Hals. London, 1902: 144, no. 770. Hofstede de Groot, Cornelis. A Catalogue Raisonné of the Works of the Most Eminent Dutch Painters of the Seventeenth Century. 8 vols. Translated by Edward G. Hawke. London, 1907-1927: 3(1910):88. Davies, Gerald S. Frans Hals. Reprint. London, 1908: 139, no. 770. Moes, Ernst Wilhelm. Frans Hals: sa vie et son oeuvre. Translated by J. de Bosschere. Brussels, 1909: 108, no. 180 or 182. Wrangell, Baron Nicolas. Les Chefs-d’Oeuvre de la Galérie de Tableaux de l’Ermitage Impérial à St. Pétersbourg. London, 1909: 145, repro. Péladan, Joséphin. Frans Hals 1580(?)-1666. Paris, 1912: 89-90, repro. opposite 162. Bode, Wilhelm von, and Moritz Julius Binder. Frans Hals: His Life and Work. 2 vols. Translated by Maurice W. Brockwell. Berlin, 1914: 2:15, no. 213, pl. 136. Bode, Wilhelm von, and Moritz Julius Binder. Frans Hals: Sein Leben und seine Werke. 2 vols. Berlin, 1914: 2:62, no. 213, pl. 136. Wrangell, Baron Nicolas. Die Meisterwerke der Gemälde-Galerie in der Ermitage zu St. Petersburg. Edited by Georg Korczewski. 2nd ed. Munich, 1918: 145, repro. Valentiner, Wilhelm R. Frans Hals: des meisters Gemälde in 318 Abbildungen. Klassiker der Kunst in Gesamtausgaben 28. Stuttgart and Berlin, 1921: 320, no. 219, repro. Knackfuss, Hermann. Frans Hals. Reprint. Bielefeld, 1923: 61, 64, repro. Valentiner, Wilhelm R. Frans Hals: des Meisters Gemälde in 322 Abbildungen. Klassiker der Kunst in Gesamtausgaben 28. 2nd ed. Stuttgart, Berlin, and Leipzig, 1923: 320, 234, repro. Weiner, Peter Paul von. Meisterwerke der Gemäldesammlung in der Eremitage zu Petrograd. Revised ed. Munich, 1923: 117, repro. Dülberg, Franz. Frans Hals: Ein Leben und ein Werk. Stuttgart, 1930: 186. Valentiner, Wilhelm R. Frans Hals Paintings in America. Westport, Connecticut, 1936: no. 91, repro. National Gallery of Art. Preliminary Catalogue of Paintings and Sculpture. Washington, 1941: 95-96, no. 71. Trivas, Numa S. The Paintings of Frans Hals. New York, 1941: 55, no. 92, repro. no. 123. National Gallery of Art. Book of illustrations. 2nd ed. Washington, 1942: no. 71, repro. 24, 240. Gratama, Gerrit David. Frans Hals. The Hague, 1946: 98, repro. National Gallery of Art. Paintings and Sculpture from the Mellon Collection. Washington, 1949 (reprinted 1953 and 1958): 78, repro. Walker, John. National Gallery of Art, Washington, D.C. New York, 1963 (reprinted 1964 in French, German, and Spanish): 1963, 311, repro. National Gallery of Art. Summary Catalogue of European Paintings and Sculpture. Washington, 1965: 65. National Gallery of Art. European Paintings and Sculpture, Illustrations. Washington, 1968: 58, repro. Slive, Seymour. Frans Hals. 3 vols. National Gallery of Art Kress Foundation Studies in the History of European Art. London, 1970–1974: 1(1970):52, 160-161, 193; 2(1970):fig. 256; 3(1974):86-87, fig. 60 (monogram). Grimm, Claus. Frans Hals: Entwicklung, Werkanalyse, Gesamtkatolog. Berlin, 1972: 107, 205, no. 134, fig. 150. Montagni, E.C. L’opera completa di Frans Hals. Classici dell’Arte. Milan, 1974: 105, no. 171, repro. National Gallery of Art. European paintings: An Illustrated Summary Catalogue. Washington, 1975: 170, repro. Walker, John. National Gallery of Art, Washington. New York, 1975: 268, no. 352, repro. Gerson, Horst. "The Frans Hals Catalogue." The Burlington Magazine 118 (June 1976): 422-424. Montagni, E.C. Tout l'oeuvre peint de Frans Hals. Translated by Simone Darses. Les classiques de l'art. Paris, 1976: no. 171, repro. Wheelock, Arthur K., Jr. Jan Vermeer. New York, 1981: 14-15, fig. 6. Walker, John. National Gallery of Art, Washington. Rev. ed. New York, 1984: 268, no. 346, color repro. Jackson-Stops, Gervase. The Treasure Houses of Britain: Five Hundred Years of Private Patronage and Art Collecting. Exh. cat. National Gallery of Art, Washington. New Haven, 1985: 324. National Gallery of Art. European Paintings: An Illustrated Catalogue. Washington, 1985: 197, repro. Wheelock, Arthur K., Jr. Jan Vermeer. Masters of Art. 2nd rev. ed. New York, 1988: 100, fig. 6. Broos, Ben P. J., ed. Great Dutch Paintings from America. Exh. cat. Royal Picture Gallery Mauritshuis, The Hague; Fine Arts Museums of San Francisco.The Hague and Zwolle, 1990: 391. Grimm, Claus. Frans Hals: The Complete Work. Translated by Jürgen Riehle. New York, 1990: 241-242, 257, fig. 105a, 288, no. 129, repro. Kopper, Philip. America's National Gallery of Art: A Gift to the Nation. New York, 1991: 93, color repro. Wheelock, Arthur K., Jr. Dutch Paintings of the Seventeenth Century. The Collections of the National Gallery of Art Systematic Catalogue. Washington, 1995: 83-85, color repro. 84. Wheelock, Arthur K., Jr. Vermeer and the Art of Painting. New Haven, 1995: 123, fig. 86. Moore, Andrew W. Houghton Hall: the Prime Minister, the Empress and the Heritage. Exh. cat. Norwich Castle Museum; Iveagh Bequest, Kenwood. London, 1996: 95, fig. 12, repro. Il'in, Nikolas, and Natalia Semënova. Prodannye sokrovishcha Rossii [Sold Treasures of Russia]. Moscow, 2000: 157, repro. Moore, Andrew, and Larissa Dukelskaya. A Capital Collection: Houghton Hall and The Hermitage. Exh. cat. Somerset House, London. New Haven and London, 2002: 249, repro. Moore, Andrew. "Sir Robert Walpole: A Prime Minister Collects Dutch and Flemish Art." In Dutch and Flemish artists in Britain, 1550-1800. Edited by Juliette Roding. Leids Kunsthistorisch Jaarboek 13. Leiden, 2003: 293-294, repro. Odom, Anne, and Wendy R. Salmond, eds. Treasures into Tractors: The Selling of Russia's Cultural Heritage, 1918-1938. Washington, D.C., 2009: repro. xii, 90, 103 n. 45, 135 n. 62. Fiedler, Susanne, and Torsten Knuth. "Vexierbilder einer Biographie: Dr. Heinz Mansfeld (1899-1959)." Mecklenburgische Jahrbücher 126 (2011):307. Jaques, Susan. The Empress of Art: Catherine the Great and the Transformation of Russia. New York, 2016: 397. Seymour Slive, Frans Hals, 3 vols. (London, 1970–1974), 3:86, no. 167. See also Wilhelm von Bode, Studien zur Geschichte der holländischen Malerei (Braunschweig, 1883), 90, no. 128. Bode speculated, on the basis of the monogram, that the artist might be Frans Hals’ son Harmen Hals, but, after Bredius discovered that this artist’s monogram was different in character, Bode immediately rejected his own hypothesis. Petr Petrovich Semenoff, Études sur l’histoire de la peinture néerlandaise, 2 vols. (Saint Petersburg, 1885), 1:254, and Andrei Ivanovich Somov, Ermitage Impérial: Catalogue de la galerie des tableaux, 3rd. ed., 2 vols. (Saint Petersburg, 1901), 2:139–140, no. 770.